CHICAGO – In our latest French comedy edition of HollywoodChicago.com Hookup: Film, we have 10 admit-two run-of-engagement movie passes up for grabs to the new film “Potiche” with Gérard Depardieu and Catherine Deneuve! “Potiche” also stars Jérémie Renier, Judith Godrèche, Karin Viard, Fabrice Luchini, Sergi López, Évelyne Dandry, Bruno Lochet, Elodie Frégé, Gautier About, Jean-Baptiste Shelmerdine, Noam Charlier, Martin De Myttenaere and Yannick Schmitz from writer and director François Ozon. The film has been nominated for four Césars (France’s equivalent of the Oscars): best actress (Catherine Deneuve), best supporting actress (Karin Viard), best adapted screenplay (François Ozon) and best costume design. The film is also an official selection at the 2010 Venice Film Festival and the 2010 Toronto International Film Festival. To win your free pass to a Chicago showing of “Potiche” from Music Box Films courtesy of HollywoodChicago.com, just answer our question below. That’s it! Directions to enter this Hookup and immediately win can be found beneath the graphic below. 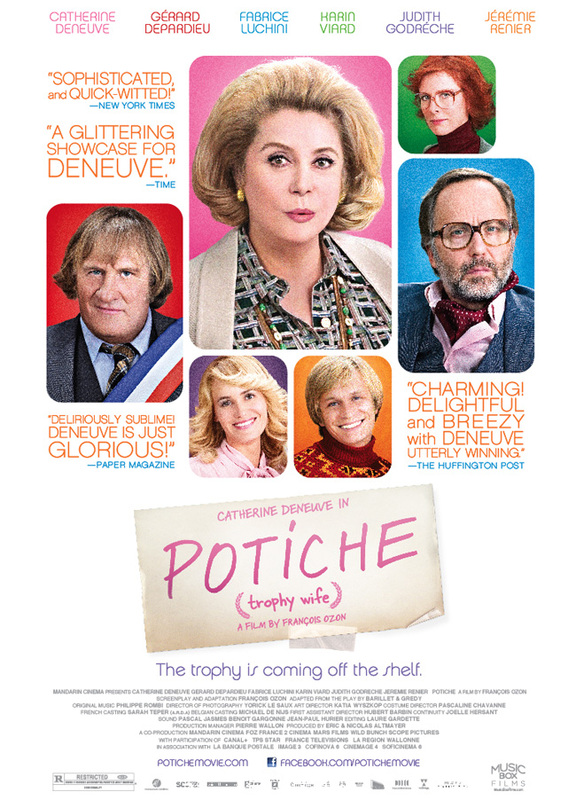 The movie poster for “Potiche” with Gérard Depardieu and Catherine Deneuve. Set in 1977 in a provincial French town, “Potiche” is a free adaptation of the 1970s eponymous hit comic play. Catherine Deneuve is Suzanne Pujol: a submissive, housebound “trophy housewife” (or “potiche”) who steps in to manage the umbrella factory run by her wealthy and tyrannical husband (Fabrice Luchini) after the workers go on strike and take him hostage. To everyone’s surprise, Suzanne proves herself a competent and assertive woman of action. But when her husband returns from a restful cruise in top form, things get complicated. Gérard Depardieu plays a former union leader and Suzanne’s ex-beau who still holds a flame for her. Acclaimed writer/director François Ozon (“Swimming Pool,” “Under the Sand,” “Time to Leave”), who had previously directed Deneuve in the international hit “8 Women,” twists the original play on its head to create his own satirical and hilarious take on the war between the sexes and classes. “Potiche” reunites French cinema legends Catherine Deneuve and Gérard Depardieu in an ensemble cast that includes comic greats Fabrice Luchini and Karin Viard (as Luchini’s secretary and mistress) while Judith Godrèche and Jérémie Renier play the Pujols’ entitled daughter and sexually ambiguous son. The impeccable 1970s era set design and costumes were created by Katia Wyzkop and Pascaline Chavanne respectively. The movie trailer for “Potiche” can be watched now below. Under what conditions would you be a trophy wife/husband? Like all Hookups here, this HollywoodChicago.com Hookup is simple: Just submit your comment below and we will award 10 admit-two tickets randomly via e-mail for our “Potiche” Hookup. Good luck! HollywoodChicago.com LLC is a promotional partner with the studio and its partners and doesn’t assume any liability for this giveaway. Winners of these passes can only print one copy to use for admission. As we will provide the theatre with the names of our winners, you must bring a valid photo ID with you should they need to verify the pass. You must have a copy of the pass in hand for entry. These passes are good for two free admissions Monday through Thursday at Landmark Century Centre Cinema in Chicago during the film’s run. These tickets do not guarantee you a seat. Seating is on a first-come, first-served basis. Along with entering yourself in this Hookup, tell your friends you’ve found the best source for regular entertainment giveaways by liking HollywoodChicago.com on Facebook and following us on Twitter! The more people who like and follow us, the better giveaways we can offer you! Submitted by Rica14 on April 17, 2011 - 5:23am. There would never be a time! Submitted by Laodoll on April 18, 2011 - 2:06pm. I will always be a trophy wife. For me, being a trophy wife would include being a strong and beautiful woman inside and out. I work, I stay looking good for me and my man, and I take care of my family. I am the foundation. I’m a winner and I was a good catch. That’s what makes me the trophy wife. As for the trophy wife that just sits there and looks good, you could definitely think that about me b/c I wouldn’t mind. Submitted by lashes235 on April 17, 2011 - 6:13am. Only if I had unlimited access to lots of money, no talkback on how I spent it or how I conducted myself, and absolutely no way of getting that access cut off. Which is probably why I will never be a trophy wife. I value my independence and ability to decide what happens too much. Submitted by hereisnancy on April 17, 2011 - 6:46am. You can be attractive and still have a mind, so never! I'd do it so long as he respected me. Submitted by Jeanelle on April 17, 2011 - 6:56am. Submitted by rebeccabraithwaite on April 17, 2011 - 7:22am. Submitted by MableGrl3 on April 17, 2011 - 7:58am. I think that I could easily be a trophy wife. I think that if the man was decent to me—not too controlling or put limits on what I could wear, etc. And gave me access to the money so that I could help people and travel. AND allowed me to work sometimes when I was bored I could do it. Submitted by Anonymous (not verified) on April 17, 2011 - 7:58am. Submitted by CBS on April 17, 2011 - 7:59am. If I loved the person who wanted me to be their trophy and the prized me it would be okay. Submitted by e on April 17, 2011 - 8:03am.